To use Sleep Cycle, you place an iPhone on your mattress while you sleep. This $0.99 app is able to monitor your body movements with the iPhone’s built-in accelerometer, thereby tracking your sleep cycles. 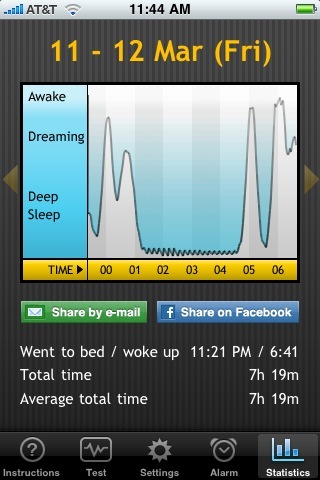 It charts how much deep sleep you are receiving, when you are going in and out of R.E.M. sleep, and a true average of the sleep you’re achieving. By monitoring your cycle, this clever app can attempt to wake you up at your most natural wake state within 30 minutes of your alarm time. When I first heard of Sleep Cycle, I got excited and immediately downloaded it before realizing that the app probably wouldn’t work in the bed I share with my wife. Wouldn’t it pick up her movements, rendering all collected data unusable? The app sat on my iPhone, never used, until I finally decided to try it this week. Sleep Cycle calibrates itself the first two nights, adjusting for the variables in your bed, mattress, and pillow. So far the results are good. After placing the iPhone on my side of the bed, the app seems to accurately track my specific cycles. If you have a king-sized bed or a tempurpedic mattress, Sleep Cycle’s results should be nearly perfect. Worried about overnight cellphone signals close to your head? Simply put your iPhone in airplane mode. Sleep Cycle’s biggest inconvenience is that because the app runs all night, you’ll have to plug your iPhone into the wall. If you can convince your wife to put up with a power cord coming out of your pillow, you can start enjoying a good night’s sleep.